From large sandwich style meats to snack size beirsticks. There are so many ways to use our delicious products in your cooking! Butch’s Smallgoods exclusive family recipes have been handed down through three generations and made for over 100 years. 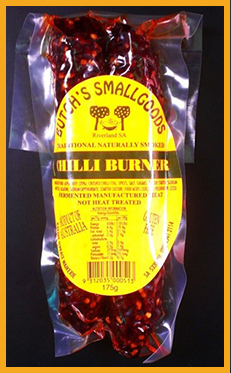 Butch, like his father Stan before him, a butcher by trade, owned the local butcher shop in Waikerie for many years, making and selling traditional German Mettwurst untl the opportunity arose to continue the family smallgoods legacy outside of the Riverland. Butch’s Smallgoods was originally named Riverland Smallgoods. Now along with his wife Sharon, Butch continues to produce smallgoods of a consistently high quality, staying true to the traditional methods. 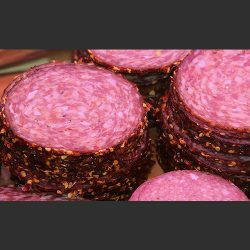 Butch’s Smallgoods offers a large range of Mettwursts, Salamis and Pepperonis. From large sandwich styles to snake size beirsticks. There are so many ways to use our delicious products in your cooking! 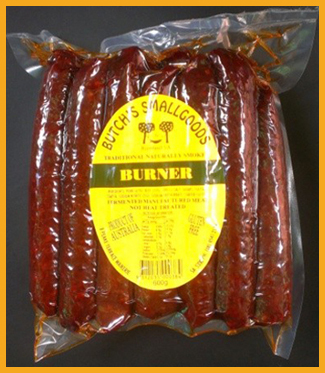 Made with Australian beef, pork and wine our naturally smoked smallgoods only use the best produce. 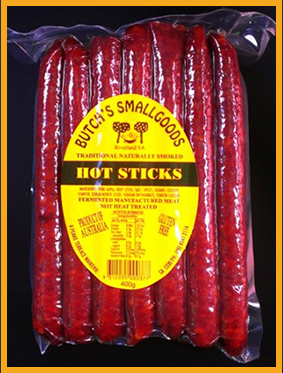 All Butch’s Smallgoods are packaged ready to eat; perfect for a picnic or sharing on a party platter! Gluten Free. Dairy Free. Nut Free. Our naturally smoked smallgoods are suitable for all common food sensitivities. Traditional style naturally smoked smallgoods. Made with Australian beef, pork and wine. Find the right product for the right occasion. Add products you wish to purchase to our shopping cart. Proceed to the checkout and enter your details. Enter your shipping address; please ensure all details are correct. Sit back and we’ll make sure your order is delivered immediately!